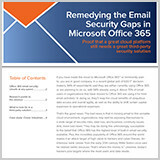 Learn about the key features and functions that you need to protect your investment, how to choose the right email security solution, and how one organization successfully navigated its way to highly satisfactory, reliable third party solutions for enhancing Office 365 email security. Microsoft Office 365 has much to offer for organizations of all sizes. For IT, the cloud-based solution can increase flexibility, reduce capital costs, and simplify administration. Which third-party solutions are essential for your Microsoft Office 365 environment today.